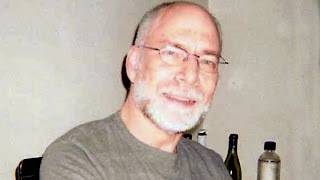 Smoke and Mirrors: Why Did OPEC-Covering Wall Street Journal Reporter, David Bird, Go Missing? Why Did OPEC-Covering Wall Street Journal Reporter, David Bird, Go Missing? Almost two weeks ago, on Saturday January 11, 55-year old David Bird, a reporter who covers energy markets for the Wall Street Journal, left his house in the Millington section of Long Hill, NJ, telling his wife that he was going out for a quick walk. He took his wallet and jacket, leaving his cell phone and the medication he takes twice daily (for liver transplant he had in 2005) behind. He never returned-- disappearing without a trace, despite a continuing search by hundreds of volunteers and law enforcement officials, including the FBI. Long Hill Township Police Department, Morris County Sheriff’s Office, Morris County Department of Law and Public Safety-Office of Emergency Management, New Jersey State Police, Morris County Park Police, Harding Township Police Department, Bernards Township Police Department, Warren Township Police Department, New Jersey State Park Police, Bergen County Sheriff’s Office, Federal Bureau of Investigation, Millington Fire Department, Stirling Fire Department, Warren Fire Department, Liberty Corner Fire Department, New Vernon Fire Department, Chatham Township Fire Department, New Providence Fire Department, Berkeley Heights Fire Department, Somerset County Department of Public Safety, Parsippany Search Rescue and Recovery, Whippany Swift Water, Boonton Dive Team, Pequannock Dive Team, Jefferson Dive Team, Picatinny Dive Team, U.S. Department of Fish and Wildlife, United States Veterans Administration Police and Fire – Lyons, NJ, Long Hill First Aid Squad, Long Hill Township Office of Emergency Management, the Salvation Army, Long Hill Community Emergency Response Team Volunteers, and the Warren Township Community Emergency Response Team. 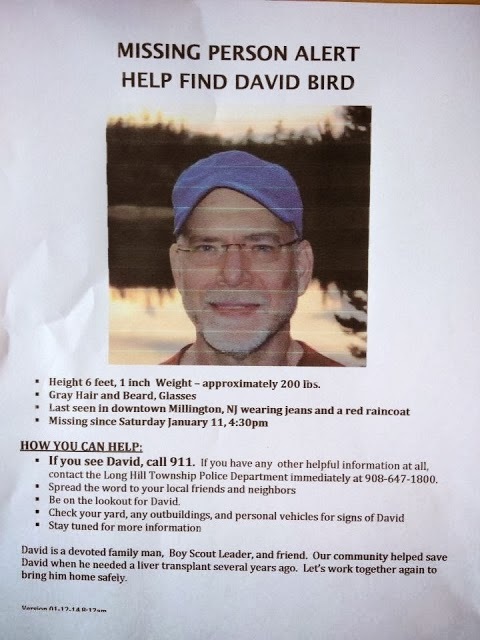 Moreover, according to all who knew him, he gave no indication of having a reason to disappear, not to mention Mr. Bird was an avid hiker, biker, camper, Boy Scout troop leader, and he ran in the New York City Marathon. In other words, the man was in good shape. While there is no evidence as of yet suggesting a connection between his work and his disappearance, NBC reported that “the family believes that his coverage of OPEC may be related to his disappearance.” He was reporting on an oil glut -- “rising fuel inventories," specifically, "a supply imbalance caused by overproduction of shale oil in the U.S. in the face of slacking demand." So it's possible that David Bird's factual reporting on the oversupply/low demand of oil might ruffle a few feathers in high places, not to mention it somewhat contradicts the propaganda that the U.S. is on the path to economic recovery. It's also possible that Mr. Bird recently came across some information not yet published. After all, the rich and powerful are always cooking up schemes to further enrich and empower themselves at our expense. “The U.S. Senate’s Permanent Subcommittee on Investigations, chaired by Senator Carl Levin, is currently investigating the role played by large Wall Street firms in owning tankers, terminals, and pipelines that store or transport oil while simultaneously speculating on the price of oil in the futures market. The investigation is broad in scope and includes Wall Street’s ownership of other commodities. It is understood that the investigation will also look at allegations by beer and soda manufacturers that Wall Street has gained control of the London Metal Exchange and metal warehouses where they have created bottlenecks in the supply of aluminum, raising prices to both the manufacturers and consumers for canned beer and soda.